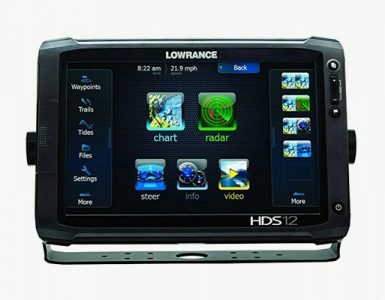 The Lowrance Hook 7 is a fishfinder and chart plotter which is well made and for reliable fish finding and chart plotting performance. 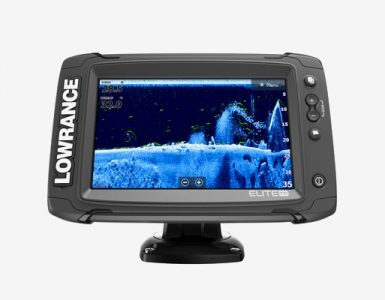 It offers demonstrated features at an incredible value without compromising the quality that fishers have come to expect from Lowrance. The benefits of CHIRP Sonar and DownScan Imaging by this unit will give you a complete and clear view of the environment beneath the boat or underwater. It features an LED backlit 7-inch 16-bit Full-Color VGA SolarMax Plus TFT display with sharp 800×480 resolution. With that being said, the images on the screen are easy to see in the case of full sunlight and moreover, it can be viewed from wide angles. It contains increased sonar sensitivity, extremely good target separation, and higher noise rejection, making it more reliable and easy to use. Moreover, this unit offers convenient page selector menu which allows quick access to all the features with the easy one-thumb operation. It has one of the most highly accurate, built-in GPS antenna, which is loaded with a detailed map of the US featuring more than 3000 lakes and rivers and also coastal contours to 1000 feet and also features Navionics+ mapping for more complete, clear and in-depth coverage. When it comes to price, its unit’s price is slightly lower. So why not go for one the most reliable and easy to use fish finders/chart plotters you will ever find at a lower price. This model also comes with the HDI Skimmer transducer and Basemaps. 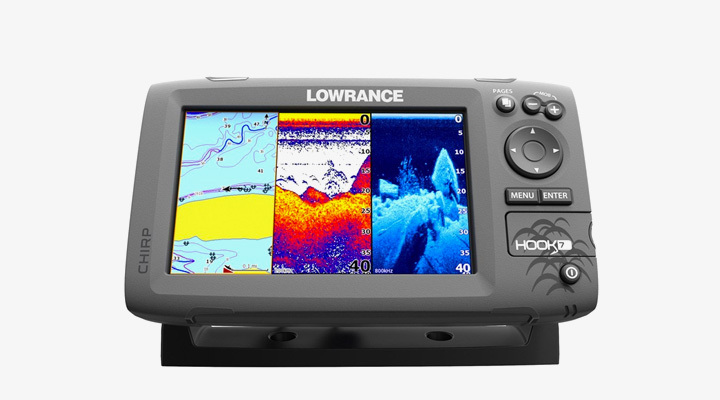 This is the only Lowrance Hook 7 reviews that you need to go through in order know the right things about it. As stated before this unit has an amazing screen resolution, color display. CHIRP Sonar plus Downscan imaging the power of today’s leading fishfinder. Technologies are combined to give a best possible view of the environment beneath the water. The Quick key allows the user to zoom up to four times the standard view and helps to focus on key fishing areas. To identify the fish targets, the unit uses Fish ID, which displays fish icons instead of fish arches. It includes highly accurate, built-in GPS antenna with detailed US map featuring more than 3000 lakes, rivers and coastal contours to 1000 feet. This model includes the HDI Skimmer transducer and Basemaps. The advance Signal Processing (ASP) decreases the requirement to adjust settings manually to see fish, structure and the bottom detail with the best possible views. There are optional Americas chart upgrades which include Lake Insight and Nautic Insight Pro and HD, navionics hot maps premium and fishing hotspots Pro. The global chart upgrade option contains navionics+ and Jeppesen c-map max n.
The convenient Page selector menu allows quick access to all the features of the unit with the one-thumb operation. 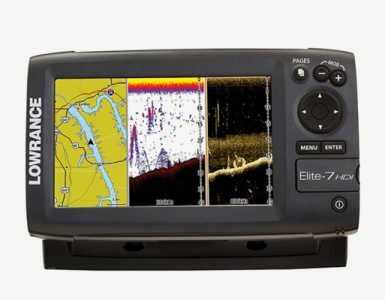 If you are looking for a well-made and easy to use fish finder or chart plotter unit with CHIRP, down view sonar, and accurate GPS then Lowrance Hook 7 is something you should invest in.